Congress president Rahul Gandhi attacked Prime Minister Narendra Modi over the Rafael fighter jet deal controversy, claiming he gave away Rs 30,000 crore to Anil Ambani. New Delhi: In a fresh attack on Prime Minister Narendra Modi over the Rafale jet deal, Congress president Rahul Gandhi Wednesday alleged the PM “sold” the Indian Air Force. Claiming Modi couldn’t look him in the eye in Parliament, Gandhi also slammed him for stealing opportunities of the youth by giving away Rs 30,000 crore to his “friend” and businessman Anil Ambani. 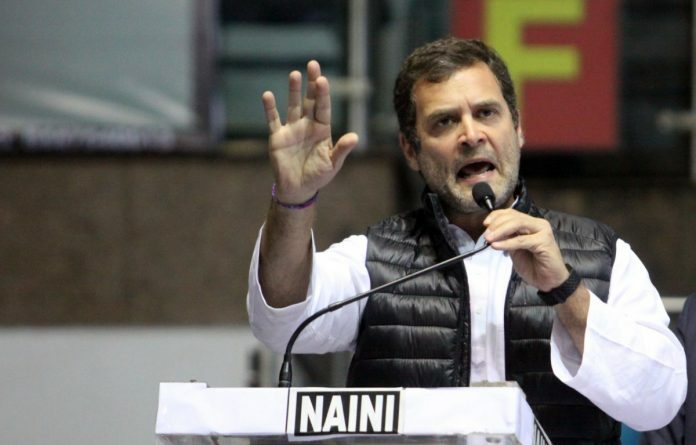 Delivering his first address as party president to the Indian Youth Congress (IYC) at New Delhi’s Talkatora Stadium, Gandhi continued his attack on the BJP over the jet deal by referencing Goa CM Manohar Parrikar, formerly the defence minister. Gandhi, who met Parrikar in Goa yesterday, said the CM had told him he had “no idea” about the Rafale deal. Earlier this month, the Congress released an audio clip purportedly of Parrikar claiming he had files related to the Rafale deal in his bedroom. The party used the audio tape to target the BJP, and said Parrikar was privy to “explosive secrets”. Parrikar on Wednesday criticised Gandhi for politicising his visit to him while he fights against a “life-threatening illness”. “In the 05 minutes that you spent with me, neither did you mention anything about Rafale nor did we discuss anything about/related to it,” Parrikar said in a letter to Gandhi. However, at the Congress youth wing event, Gandhi said no one can suppress the truth about the deal. Citing the winter session of the Parliament, Gandhi said the Prime Minister looked away when questioned about the deal. “When we asked 3-4 questions about the Rafale deal, he looked at all the sides but was unable to look me in the eye,” the Congress president said. Gandhi also said that the Modi government had completely failed in “providing employment to the youth” as well as “solving the agrarian crisis” in the country. As he concluded his speech, Gandhi congratulated the Youth Congress for successfully completing the nation-wide Yuva Kranti Yatra and successfully exposing the “fraudulent work” done by the BJP-led government. The yatra, which began on 16 December at Kanyakumari in Tamil Nadu, ended today. Several senior Congress leaders including former Delhi chief minister Sheila Dikshit and former Union cabinet minister Anand Sharma were also present at the event.